The Chemist shop is open-plan but has two distinct ‘sections’. The general heating to the establishment keeps the whole shop warm but in the winter there is an acute problem to the front of the shop due to the heat loss through the main entrance as customers come and go. 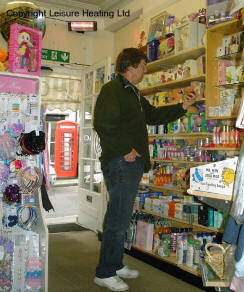 Due to the effect of radiant Infra-red, people shopping in the chemist are heated directly without the need to increase the general heating. As a consequence, overall heating costs are reduced, and customers feel comfortably warm in an improved shopping environment. 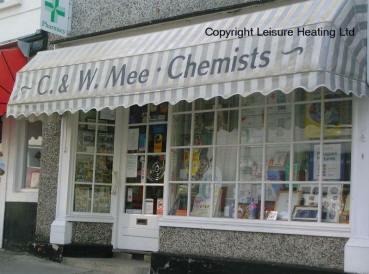 Copyright Leisure Heating Ltd. Case study used exclusively by written permission from C&W Mee Chemists, Chagford, Devon. Infra-red heating is based on the transfer of thermal energy by electromagnetic radiation. Infra-red emitters are classified according to the temperature dependent peak wavelength which they emit and can be short-wave, medium-wave and long-wave. Short-wave infra-red heaters have the ability to heat people directly without having to heat up the air first. They are compact, energy efficient and easily installed.